If you miss the 1990s, you'll love "Your Bright Future: 12 Contemporary Artists from Korea." Despite the forward-looking title, the new exhibition at the Los Angeles County Museum of Art seems locked in a wheezing, pre-millennial artistic frame of mind. The 1990s is the decade when Conceptually oriented installation art and space-and-time swallowing video projections were thoroughly institutionalized. Installation art and video projections dominate LACMA's show. Even the small, modest ink drawings at the entry by Koo Jeong-A are enshrined as an installation, transformed by the artist into photographic images projected up close onto a wall. The overwhelming immediacy of her 1,001 brain-to-page doodles is given remote distance by camera reproduction. A projector is duct-taped to a pedestal, enhancing the transient aura of a museum or art school lecture hall. Koo's set-up speaks to the peripatetic travels of art and artists in a globalizing world, when the experience of "being there" is mediated by countless interruptions. Her work's Conceptual link to the 1,001 ancient tales of "Arabian Nights" can easily be described, giving the installation a narrative to which a viewer — or, more likely, a curator, dealer or collector — can cling. But the delirious pull of those other 1,001 tales is here ground down into the driest theoretical dust. Koo's opening installation is a cousin of the bloated "Storage Piece" by Haegue Yang with which the show concludes. The floor of the final room is covered with a grid of industrial shipping pallets; taped and labeled cardboard boxes are neatly stacked in one corner, plastic crates and bubble-wrapped containers in the corner opposite. At the preview, a mercifully short performance lent a degree of gender specificity to both accumulations, which supposedly represent stored sculptures and drawings. But sculpture as material stuff to be shipped and stored until such time as it finds a more permanent home — that is, sculpture as the problematic residue of participation in an international art world — is pretty thin gruel. The work's most resonant feature is accidental and mundane: The corporate sponsor of "Your Bright Future" is Hanjin Shipping, a South Korean conglomerate. Critiquing the institutionalized art world was a staple of 1990s art, meaning that it was also a kind of institutional ready-made. Artworks and institutions held one another in a firm embrace. At LACMA the symbiotic grip is celebrated in the show's title work — Bahc Yiso's "Your Bright Future," an array of 10 floodlights connected to one another by rickety wooden struts and electrical wiring. Bahc's shining lights tilt upward, so I suppose they can be personified as a cross between an optimistic crowd and the crushing power of propaganda to demand national obeisance to a political "dear leader." That's the interpretation advanced in the exhibition catalog. But they are also theatrical spotlights illuminating an ordinary white gallery wall — its own sort of dictatorial structure, which has been leading art around by the nose for decades. Show business, or the business of making shows, is as much an international art job as it is a Hollywood career. A decade ago, New Yorker art critic Peter Schjeldahl famously coined the term "festival art" for this 1990s development. 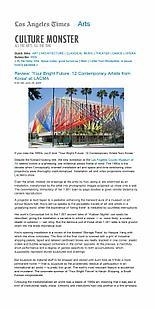 LACMA repeats it out on Wilshire Boulevard with Choi Jeong-Hwa's party-bunting of red, yellow and blue ribbons gift-wrapping the Ahmanson Building. Titled "Welcome," Choi's installation is a decorative adornment as fitting for a Hyundai showroom as for an art museum. Inside the galleries, with room-size video installations of varying tedium by Kimsooja, Minouk Lim and Jeon Joonho, the other primary festival indicator is simply the absence of any paintings. Painting is often erroneously thought to be antithetical to institutional critique, since paint on canvas is associated with traditional institutional authority. But even though almost all the show's 37 works were made in just the last five years, a clearer explanation for why painting isn't part of this show is that the art market collapsed in the early 1990s, in the wake of an economic recession. The huge market-boom of the '80s had been fueled by Neo-Expressionism, Neo-Geo and other types of painting; when the boom went bust, painting became suspect. For these dozen South Korean artists, the timing also has a social dimension. All 12 were born between 1957 and 1972. They form a generation that came of age as the 1990s unfolded. South Korea's bumpy, sometimes tumultuous political history after World War II had just begun to settle by then. The first civilian leader in decades took power, democratically elected in 1992. Korea became an active participant in the globalizing world — in art as elsewhere. Painting was out, and festival art encapsulated "your bright future." Understandably, these artists climbed onboard. Many primarily live or work in Europe and the United States, since that is where the deeply institutionalized art centers are found. Jooyean Park's single-channel video, "Monologue," represents the shift. She dubs European teachers speaking English with Korean voice-overs also speaking English. Conceived by LACMA curator Lynn Zelevansky; Christine Starkman of the Museum of Fine Arts, Houston, where it travels next; and, Sun Jung Kim, director of Seoul's Space for Contemporary Art, the show has cultural displacement as its most common theme. In addition to Koo's projected drawings, Yang's storage piece and Park's layered language, the theme describes Kimsooja's six-channel video of an anonymous woman (actually a self-portrait) inserted into the street-life of six world-cities, Gimhongsok's satirical videos of false histories and others. And yet, by far the most compelling (and flatly beautiful) piece is the show's most conventional sculpture — Do Ho Suh's "Home Within a Home." Call it post-festival art. Suh has been exploring a dislocated domestic theme for many years. A highly theatrical one in the exhibition slams a traditional Korean house into the side of a remarkably detailed, bifurcated Victorian apartment building. The house is like one he grew up in, while the apartment is modeled on one in Rhode Island where he lived as a student. Debris is scattered on the gallery floor. Yet, it's a translucent, clear-resin version of this work installed nearby that is truly captivating. Cut into four pieces that rest on pedestals made from movable carts, the ghostly apartment building slowly gives up the spectral form of the Korean house embedded inside it. The two homes are united into a single seamless space, which could be opened up for examination and rearranged simply by moving the four carts around. Regardless of the configuration, however, the fusion-home looks utterly alien — a world of forced estrangement that, however disturbing, is essential to seeing things anew. It's a knockout sculpture, and just about the only piece in the show that feels current.